piraea alba var. latifolia.es.wikipedia.org (Accessed 5/2014). 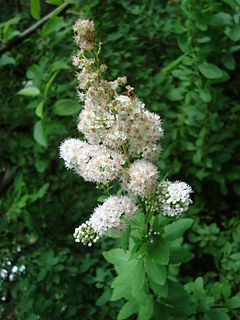 Spiraea alba var. latifolia is a shrub, to 2 m tall, colonial from rhizomes, stems slender, twigs brown, bark shredding. Leaves alternate, to 7 cm long, widest above middle, tip barely pointed, base tapered to stalk, margin doubly toothed, almost hairless. Flowers white, tiny, 5-parted with many stamens; inflorescence pyramidal, branched, dense; blooms June- Aug.
Wetland status: FACW+. S. latifolia listed as FAC+ (Reed 1988). Habitat: Moist to dry open areas, old fields, serpentine barrens. Prefers soil pH 6.6-7.5. Tolerant of flooding, drought, soil compaction. Intolerant of salt, shade (Hightshoe 1988). Notes: Attacked by the Spiraea aphid, Aphis spiraecola, the Spiraea leaf roller moth, Olethreutes hemidesma and the Spiraea scale, a mealy bug, Eriococcus borealis. Among the fungi infecting meadowsweet are; Cylindrosporium ariaefolium, C. fairmanianum (Deuteromycotina) and Podosphaera cladestine (Ascomycotina) (Hall et al. 1974; Agrios 1988).